Today was scheduled to be the longest (mileage) ride of the entire trip: 57 miles. Certainly, there were options for folks who just didn’t feel like cycling that far — but you had to choose your route first thing in the AM, because shorter distances involved shuttles straight from Kindred Spirits. Most everyone chose the long route, and considering we had all day to accomplish it, the long ride was not much trouble, just a long time in the saddle. Our weather the last few days has been absolutely perfect, and held for us today — some sun screen and breezes (a following wind today!) to keep the bugs off. Well a cyclist cannot ask for more. The night before, several of us had discussed our approach to the ride. Since the entire beginning was a reverse of what we’d done yesterday, some of us decided that we wanted to get started and get that part over with as quickly as possible, so we could get to the “virgin territory.” So four of us, Jack, Bruce, Craig and I, formed up into a pace line and retraced our wheel tracks from yesterday. Our average speed during that part of the ride was well over 15 MPH. As it happens, a big annual bicycle ride, the Grand-Fondo, was scheduled on this day also. Some of their ride was along our route, and we were able to take advantage of their signage, some of the Transportation workers (who were on roads to stop traffic for the cyclists especially for left turns), and some of the locals’ “feel good” about cycling (we were cheered a few times by residents along the route). As we climbed the very first hill out of Kindred Spirits, there were Transportation workers at the traffic light and they asked if we were part of the Fondo, and were relieved that we were not very early harbingers of their work for the day. We really appreciated the help. When the four of us made it back to the point in the National Park where the paved trail began, Craig stopped to take a photo and we stopped to use the washrooms. 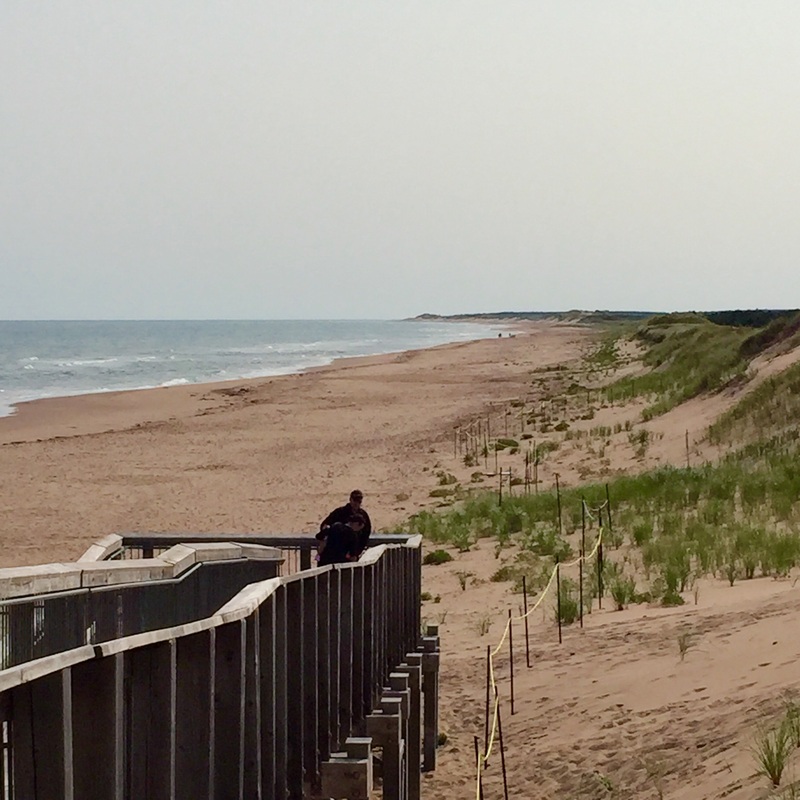 There was also a boardwalk over the dunes we’d not walked yesterday, so we did that and came back. By the time we’d finished, Craig was nowhere to be seen. We picked him up again, well after we’d waved as we passed Dalvay by the Sea again, and Allen and the rental van that we all call the Starship Enterprise (it is an Enterprise rental) was waiting for us in Mt. 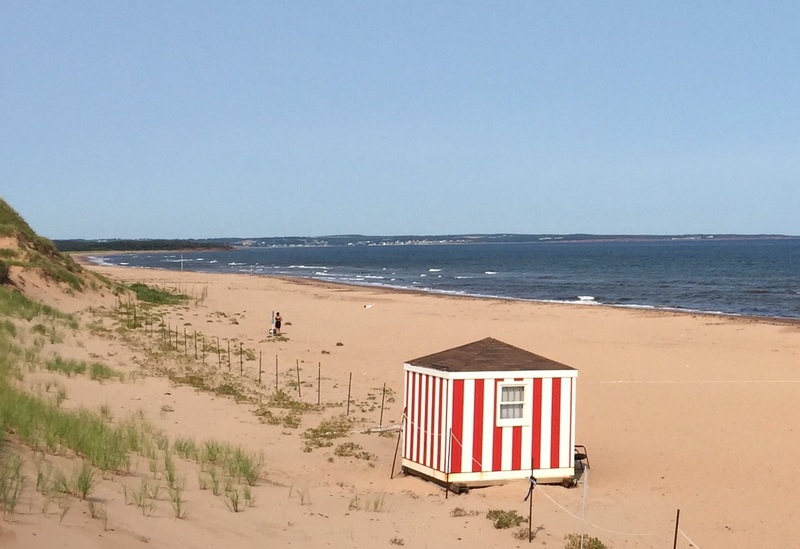 Stewart, not far after we had joined the Confederation Trail, an unpaved but vehicle-free path through the trees and marshlands of Eastern Prince Edward Island. There, we also re-united with Craig. 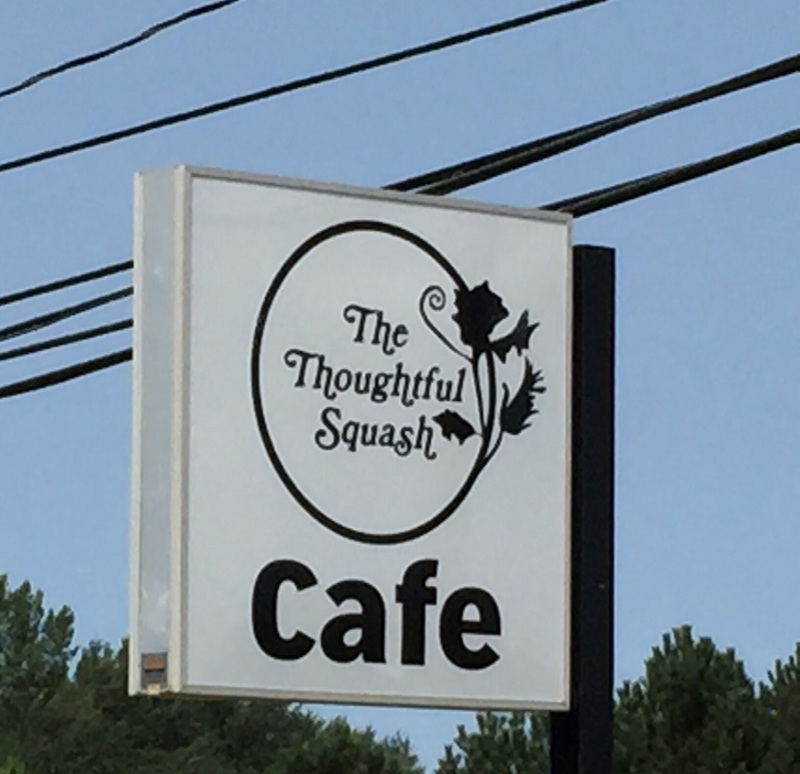 Allen directed us to the Thoughtful Squash cafe, which offered excellent victuals, but they took forever and forever to get us served. Just after the four of us had ordered (Craig had a PB&J Hamburger — sounded foul but he said it was pretty good–I had a bacon cheeseburger), the rest of the gang, all those doing the long route, plus those who had been shuttled, came in also and the wait time increased. Allen even took on some of the plate-delivery duties to speed things up. It made Bruce crazy to wait, so when he was done, he bolted up the road with his wife, Linda. 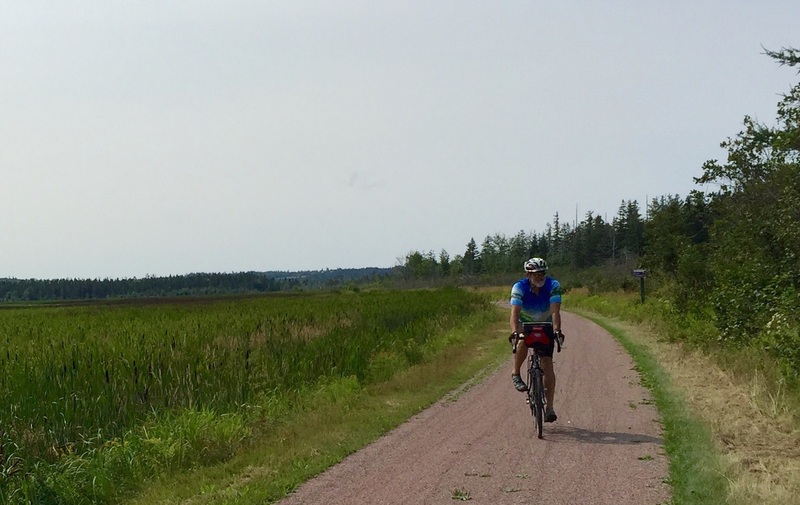 Craig, Jack and I left shortly before the rest of the gang, and the remainder of the ride along the Confederation Trail was just lovely, really nice to be vehicle-free, and reminiscent of the New River Trail back home (except we met extremely few other users). Nice and flat. 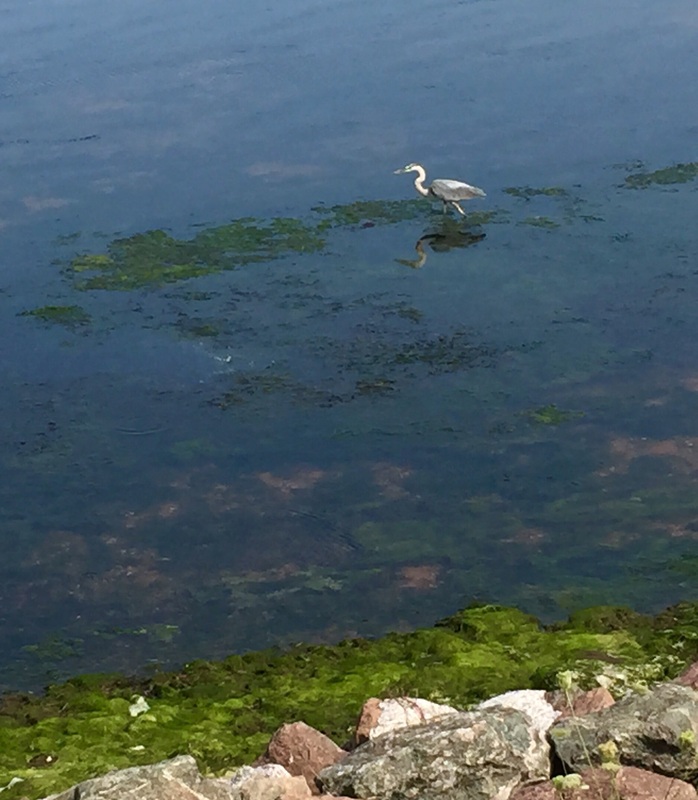 We saw many cool things along the way: songbirds galore, a yellow-shafted flicker, a nest full of 2 young begging osprey chicks (just prior to fledging) and many great blue herons hunting in the shallows of the St. Peter’s Bay. Some of the herons stayed still as tree stumps long enough for a few pix, but many would have none of it and they flew away. They looked like teradactyls. 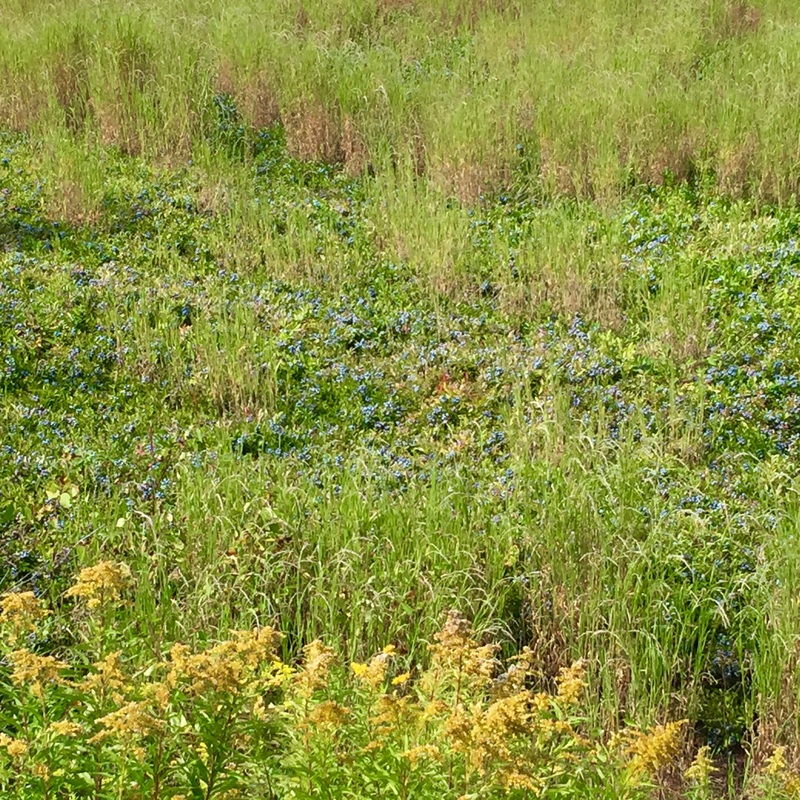 We also saw several fields of the same type of low-bush blueberries we’d seen when we were dropping off Roomba with our friends in East Gore. There was a huge combine-like machine harvesting, and stacks and stacks of neon-colored packing crates in the fields. They were on both sides of the Trail and one un-harvested field offered a lovely show of fat blue berries. 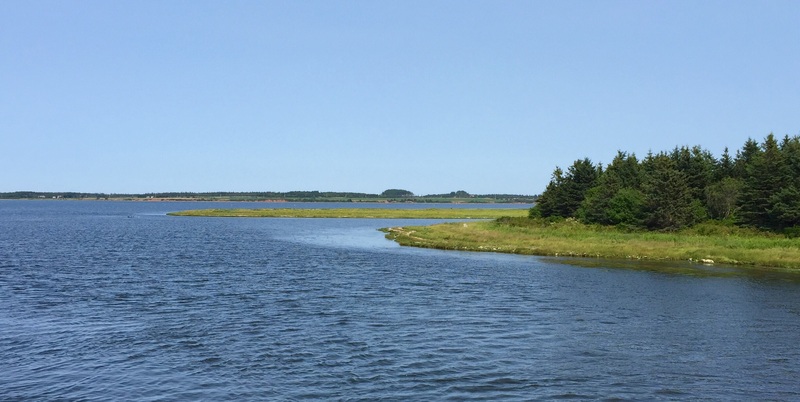 Two of the views along the Confederation Trail where the woodsy area broke and you could see the shoreline. We rolled into St. Peters around 3, I’d guess. 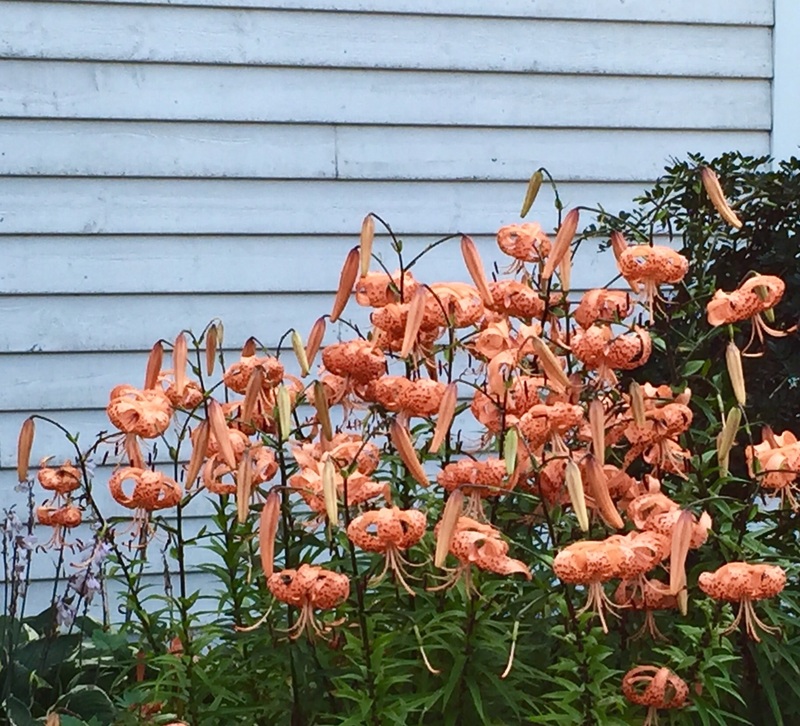 The community of St. Peters dates to the early 1700s, having been settled by the French. 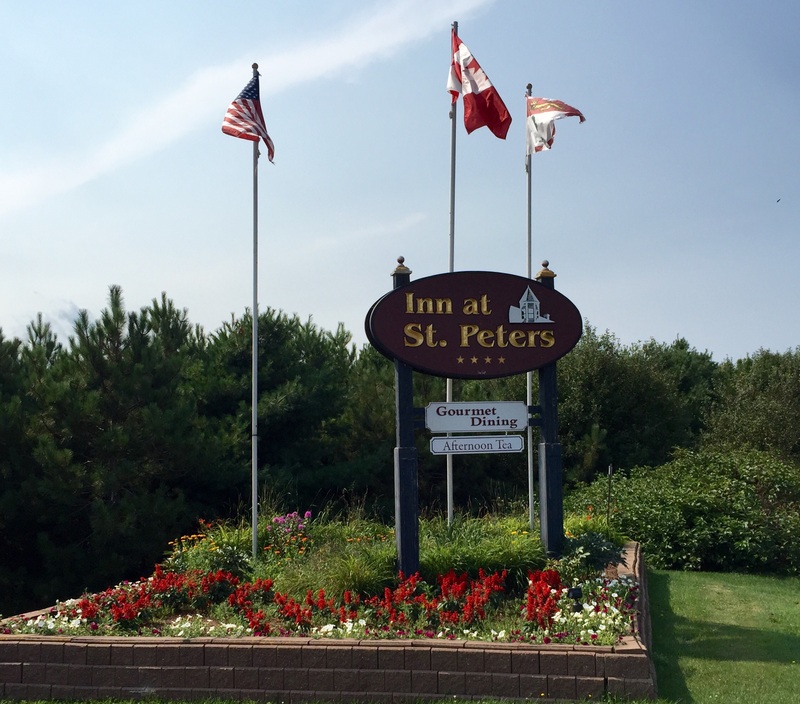 In 1953, the village was incorporated into the Community of St. Peter’s Bay. 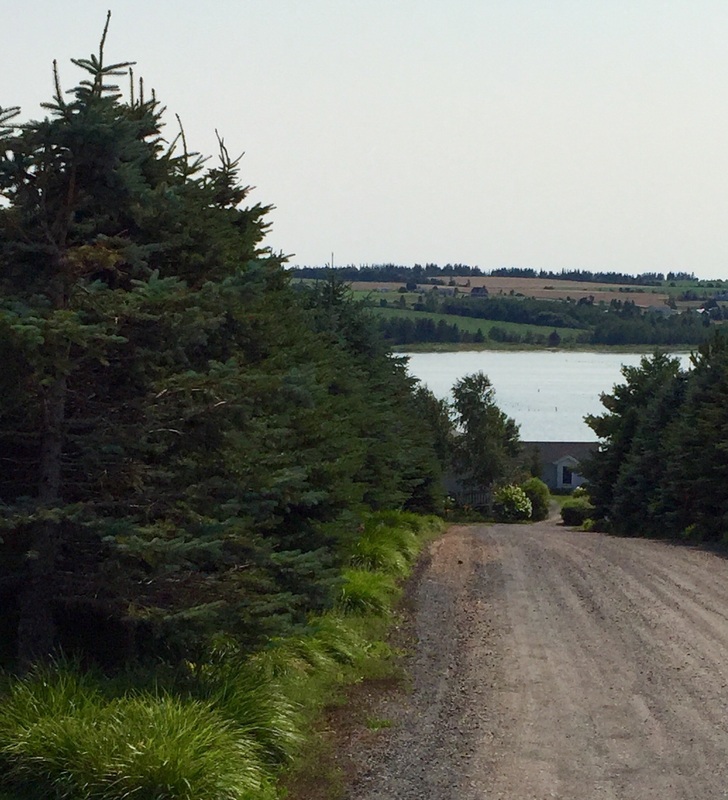 It is quite a lovely place well-geared for tourism and visitors, as we rolled through the harbor area and climbed up the side of the Bay opposite from where we had been riding on the Confederation Trail, to get to our lodging. 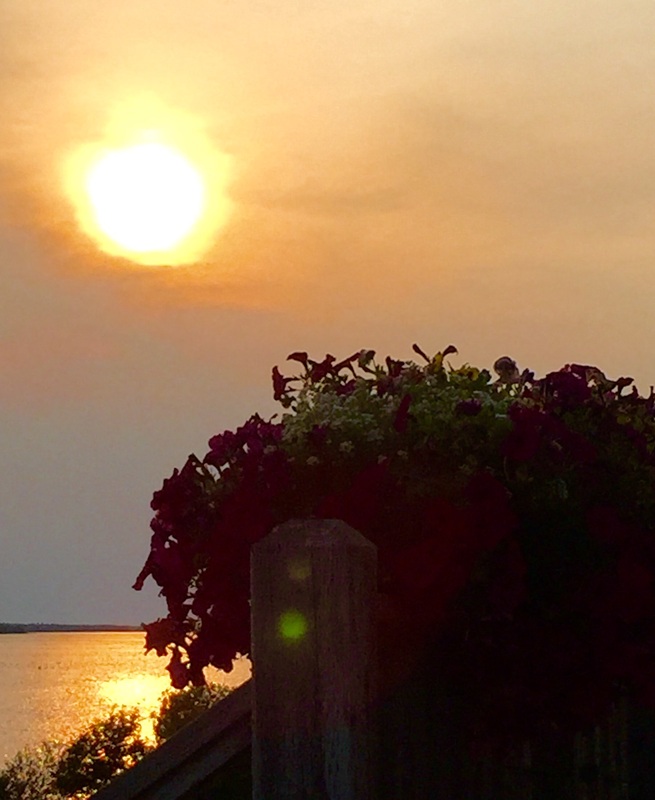 The Inn at St. Peters is a beautiful setting on a hill above the Bay, with lovely gardens, a gazebo by the water, cabins with porches where you can sit and watch the sun set, and a spectacular dining experience. Part of what you pay for here is a 3 course meal, but each of our sub-groups (we had to arranged ourselves into 4-somes) had to have different seating times. 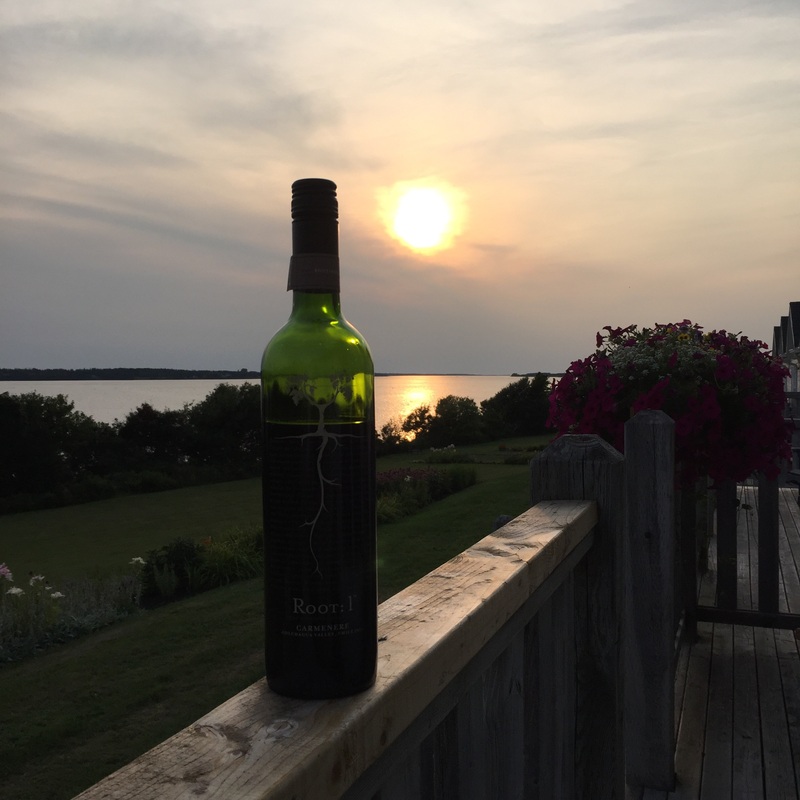 While Jack and I waited for ours, we showered, did some of our laundry in the tub (and hung it all out on the porch) and then later, invited Allen and Mary over for a glass of wine as the sun set. We ate with Allen and Mary, and while Mary had the salad for a starter, the rest of us had pork tacos to start. I had duck, Jack ate pheasant, Allen had beef and Mary had crab cakes. One of the best meals I’ve had in a very long time. Gaye and Woody were celebrating their 50th wedding anniversary, so we all gathered in the bar after dinner (while our table enjoyed our desserts with the group) to toast them with champagne. It was a very fun gathering. As some drifted away after the celebration, Jack bought a final round of drinks for those remaining, including Woody and Gaye, Allen and Mary, and Dave. It was a fine finish. 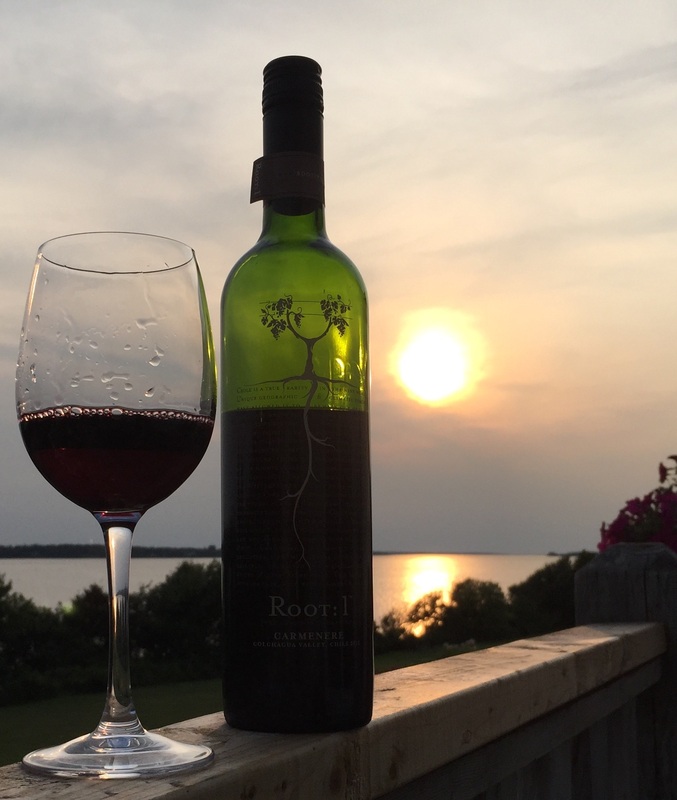 Perfect ending to a truly spectacular day. So glad we get to stay here another night!